Progress to date, and the remaining miles to Deadhorse. Summary of all stages. Wow, we've come a long way! 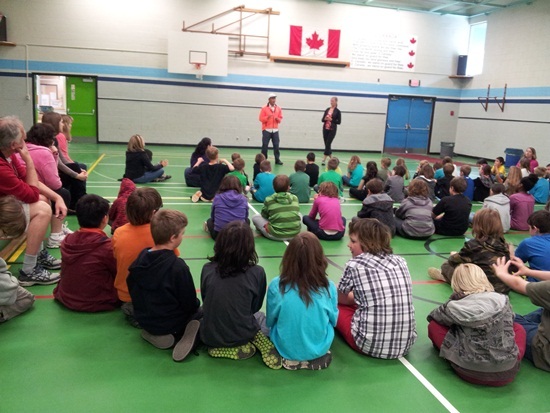 Oh, here's a photo of us speaking to students at the Oyster Bay Elementary School (photo courtesy of Beth Newman). This was when we left Campbell River (photo courtesy of Bruce & Wendy Murdoch). Back on the road. In Woss (43 miles north of Sayward, our last update), the tire blew out. Not able to ride, we wait on the side of the road to hitch to Port Hardy. Looking south, we are across the road from the Woss sign. Woss up? 110 km (some 65 miles) south of Port Hardy. We needed to get to Port Hardy in time to catch the ferry to Prince Rupert. Three hitches and thanks to a couple from Port McNeill (thanks for the tire! ), we get to Port Hardy in time for the ferry. Tauru makes some warm drinks before getting on the boat. Relief! In the boat and on our way to Prince Rupert some 320 nautical miles north. It must be early season since the boat is empty. Christi takes a nap. She is not feeling well. Perhaps being caught in the rain a couple of days ago got to her. Later, Tauru takes his turn at napping. A port town along the Inner Passage. We set up a temporary "office" to do some catching up on the computer. Near 10:30pm, we pull into Prince Rupert. The car deck is practically empty. Time to venture into the dark, something we don't like. But luckily, we have a Couchsurfing host in town! We just have to find our way there in the dark. Staying with our Couchsurfing host is this French couple! 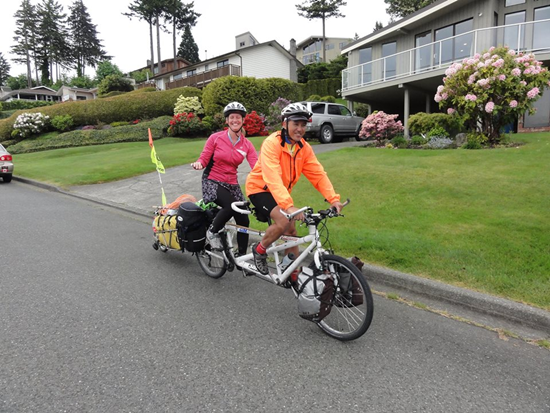 They are also on a tandem, and they are amazing! They have been riding for the past two years. 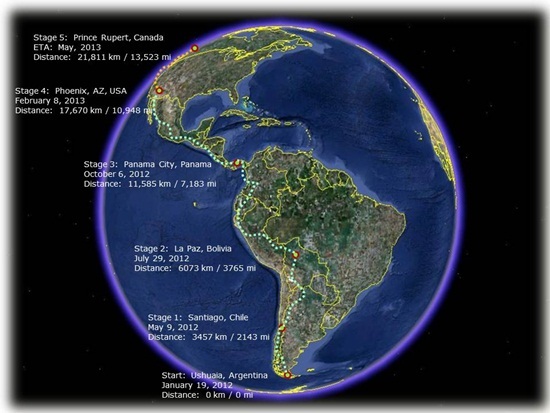 They started in France and went east through Russia and then down to Southeast Asia, then over to Australia and New Zealand, and then flew to Los Angeles and rode up the Pacific Coast and took the same ferry from Port Hardy to Prince Rupert a couple of days before us. Really amazing! Check out their website HEREF.